As the new millennium opened, PPJPC focused on telling the untold story of the economic sanctions on Iraq and the effects of depleted uranium used in the Gulf War. Numerous speaking engagements, post cards campaigns, vigils, and congressional visits were carried out to raise public awareness on these issues. Most notable of these efforts was a continuous 42-hour vigil on the coldest day and night of the year 2001 marking the 10th anniversary of the 42 days of U.S. bombing during the Gulf War. The Lowell School Urban Renewal project was resurrected by the city and discussions began regarding redevelopment of the 52-acre parcel that included our PPJPC office on East Fountain Blvd. After a lengthy battle to save the PPJPC’s storefront office on East Fountain, and the home of Mary and Peter Sprunger-Froese, the city’s urban renewal department bought the property and eventually demolished it. As this battle was raging, Dorothy Schlaeger and the Board searched for a new office space. The search for a new PPJPC home ended when Centura Health offered the old fire station at 29 South Institute for rent of $1/year on the condition that the Commission would renovate it. A 7-year lease with Centura Health was signed in November, 1999. Molly Mulligan became the office manager and chair of the building committee spearheading the $40,000 renovation project. An unbelievable outpouring of volunteer help, added to the contracted portions of the renovation, completed the work in record time enabling PPJPC to move into the ‘new’ facility in the spring of 2000. In March 2000, PPJPC’s application for VISTA Volunteers was awarded two positions for 2000. These were two full-time staff positions with salaries paid by the government. Two extraordinary, highly creative, multitalented women were hired—Shea Picklener and Margot Zahner. With them PPJPC gained two other extraordinary volunteers—Paul Wilson (Shea’s significant other) and Tom Benevento (Margot’s husband). Shea stayed on a second year (2001) and in 2002 we were again awarded two positions which were filled by two other extraordinary women—Paula Gossage and Jean Ferguson. By 2001, PPJPC had a new Board of 10 members drawn from the active membership of the Commission. 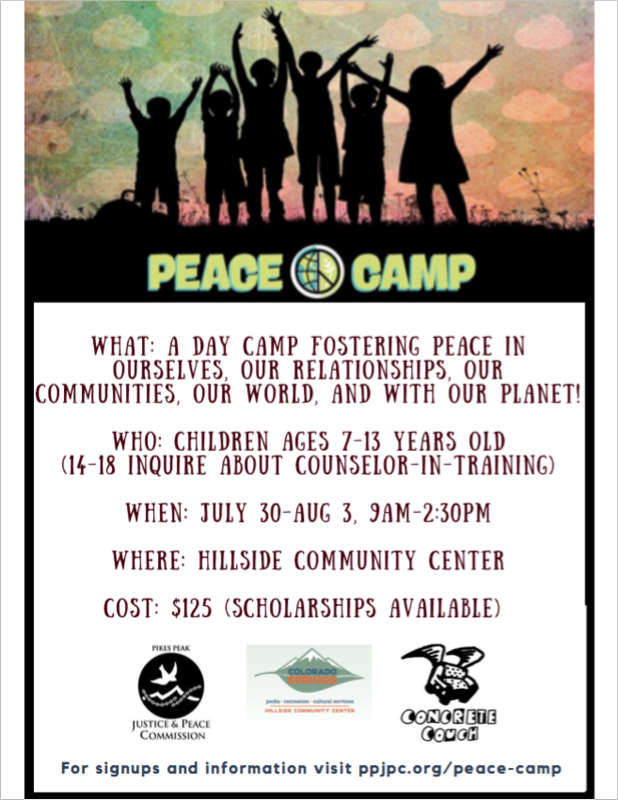 The first annual Peace Camp was held in the summer of 2000, offering children cooperative games, peacemaking strategies, teamwork activities and other fun. PPJPC also began eco-justice Coffee Houses in 2000 featuring live entertainment, fair trade coffee, herbal tea and community building. Indymedia Newsreal discussions were held monthly beginning in the early 2000’s. In August 2001 the first PPJPC website was designed and launched by Richard Jones Christie.. Terrorist attacks of 9-11-01 brought PPJPC folks to the streets, calling for peaceful resolutions, not retaliation with violence. PPJPC began weekly bannering in downtown Colorado Springs, sponsored monthly anti-war rallies, and formed discussion and action groups. In collaboration with the Penrose Library system and Food for Thought, PPJPC organized and sponsored the “Facing the Future” project which consisted of four panels which focused on the U.S. response to the terrorist attacks of 9-11. The panels addressed the issues of national and global security, why the world hates the U.S., war, faith, nonviolence and related topics. The panels were held live and also videotaped for later broadcast on the library’s cable channel. In 2002, PPJPC in collaboration with other local organizations sponsored “The USA Patriot Act: One Year Later,” a conference on the ramifications and implications of the USA Patriot Act one year after President Bush signed it into law. This event was also broadcast on the local library channel. Vandals struck the PPJPC office twice, first with rocks, then with arson in 2002 resulting in minor damage. In June 2002 PPJPC received an eviction notice from landlord Centura Health who had entered into a sales contract for acreage that included the old fire station. The named developer intended to tear the building down. Realizing its historical significance (the last fire station in Colorado Springs to use horse-drawn fire fighting equipment), PPJPC approached the city’s historic preservation commission making a case for the preservation of the building which was granted. Centura Health later donated the building to the Fire Department which had been trying to obtain it for many years. PPJPC-sponsored classes on challenging corporate power, living simply, building neighborhood community spirit, ecology and environment, and identifying with the poor continued to be strong. The year of 2003 focused around continued anti-war efforts against the war on Iraq, including the statewide February 15th anti-war rally held in Palmer Park in Colorado Springs which drew some 4000 participants from around the state. More than 30 people were arrested and police used tear-gas on the crowd, which drew sharp criticism from activists and the general public. “From Violence to Wholeness,” a 10-session program that explores the spirituality and practice of nonviolence in everyday life was offered in 2003 and 2004. On August 9, 2003, PPJPC moved from its beloved old fire station to its present location at 214 East Vermijo Street. As compensation for breaking our lease, Centura Health agreed to pay the rent at our new location for the remaining duration of our 7-year lease, that is until November 2006. PPJPC celebrated its 25th Anniversary at its annual open house on October 19th 2003. For approximately a year beginning in the fall of 2003, PPJPC board, staff and committed volunteers engaged in a “visioning process” through the generosity and under the direction of Jim Francek who, at the time, directed the non-profit division of the Center for Creative Leadership. Jim and his wife Pat were a dynamic leadership team that challenged PPJPC to identify key issues to pursue in order to improve the Commission’s effectiveness. Using the approach of “Appreciative Inquiry,” PPJPC Board, staff and several volunteers attempted to interview as many Commission members as possible to discern from them the core strengths of the Commission and to focus our goals and objectives for the next five years. When members were asked “What inspired you most about the J & P and what has kept you as members?” the most frequent answer received by the interviewers was “The core members walk the talk!” Their counter-cultural life style truly inspired others—they walked, rode bicycles, took the bus, used clotheslines, composted, gardened, recycled, collaborated, lived simply, cared about the poor and homeless, refused to support war through taxes, used solar ovens, spoke truth to power—and at all times and places, championed nonviolence. In October 2004, PPJPC unveiled a five-year vision which had grown out of our year-long visioning process. These are currently displayed in the PPJPC office. Through the late ‘90’s and to the present, PPJPC has raised awareness concerning the SOA (now WHISC); several members have participated in the annual protest at Fort Benning, Georgia. Bill and Genie Durland, and also Dennis Apuan have served on Christian Peacemaker Teams. All three have been to Hebron; the Durlands have also gone to Iraq and to the Mexican border as Christian Peacemakers. Other endeavors: Have supported the annual Season for Nonviolence; Paul Burke’s “Life, Meaning, and Videotape”; Mothering Mother Earth Fair (a collaborative effort promoting sustainability); Several panels and forums on various justice and peace issues organized and facilitated by Bill Durland; Annual Sisters’ Witness Against War initiated by Barbara Huber, SC in 2002; Program of military and ‘CO’ counseling was initiated in 2004 to assist individuals involved in or concerned over current extensions of military engagement in the Middle East and the possible implementation of military draft in the future. In August 2005, the PPJPC Board, staff, and several volunteers participated in a weekend training in Nonviolent Communication led by Robert Gonzales, Director of the Center for Nonviolent Communication in Prescott, AZ. The training was based on the principles, philosophy, and writings of Dr. Marshall Rosenberg. Sister Dorothy Schlaeger left the position of Director in August, 2005. Shanyn Doan replaced Dorothy Schlaeger and served as Director from August 2005 through December 2006. The Pikes Peak Justice and Peace Commission is a community-based organization grounded in principles of nonviolence, solidarity with the poor and oppressed, sustainable living, and social and economic justice. We engage our community as partners in creating systemic change on local, national and global issues by educating, organizing and nurturing a world of justice and peace.